The Gentleman’s Guide by Mackenzi Lee wasn’t as much fun as I thought it would be. But it was well written. 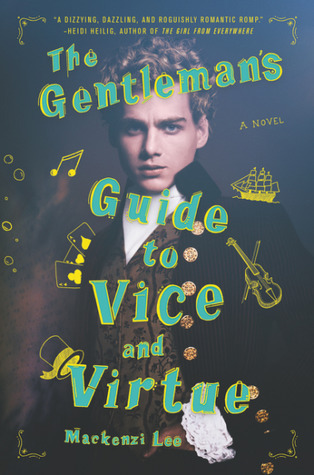 I give The Gentleman’s Guide to Vice and Virtue by Mackenzi Lee three out of five hearts, I didn’t love it as much as I thought it would and it fell a bit flat for me. Monty’s love for the dark boy Percy is clear from the beginning and even though he makes several moves during the novel I found it took forever for them to actual get anywhere for a romantic novel. There were no reason for it at all and maybe it would have been more fun to read if they had been together earlier in the book. Percy is a tortured boy, he has a dark skin, lives with his aunt and uncle and doesn’t have much money. But he also has to go to school in The Netherlands after their year on the mainland. The real reason why he has to go to The Netherlands and I found it a bit odd. I loved Felicity she was all up for equality between men and women. She wants to be a doctor or surgeon, but her gender doesn’t allow for it. It made me happy that in the end she still got her wish, unfortunately not for every woman in the world. Overall the story of The Gentleman’s Guide is well written, but I thought there would be more stupid drunken behaviour than there was. Not that I think drunken behavior is good, but the pieces where Monty is drunk are sort of more fun than most of the novel. I loved the travels and the adventure, but Monty and Percy weren’t my favourites. I loved Felicity though. This entry was posted in Book Review and tagged Adventure, Book Review, History, LGBT, Mackenzi Lee, Romance. Bookmark the permalink.